ROX Lava: "I’m preparing some champions that other players don’t play." On the 22nd of February (KST), the 2018 LCK Spring Split match between ROX Tigers and MVP took place. In the match, ROX defeated MVP 2-0. In both games, ROX played very aggressively and won all important fights to take the lead. Kim “Lava” Tae-hoon picked Ekko in game 1 and delivered outstanding performance. He played Zoe in the following game and led the team to victory. The following is the interview with Lava. 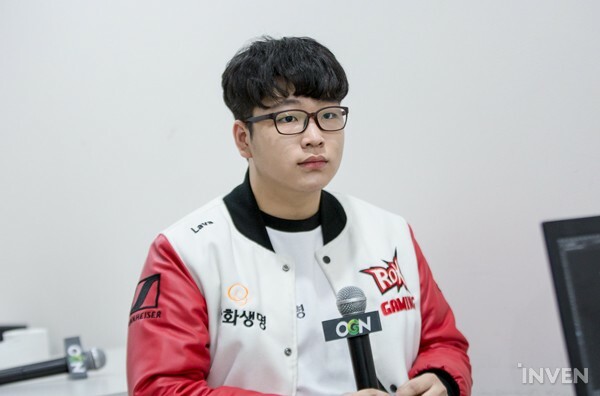 Related: ROX Lava: "The coaches thought Ekko was good and suggested to me to play him." Q. How do you feel winning the last match of round 1? We needed to win today to become 5th. I’m happy to end round 1 this way. Q. Today’s match was very one-sided. Was there any change during the Lunar New Year break? We didn’t do much, we just played scrims during the break so that we don’t lose our sense. Q. Ekko is a champion with risks. Did you think you’ll be able to do well even in the late game? He’s not very good if the game goes very late but we thought that if we took benefit in the early-mid game, it’s good enough. Today, I had a few critical situations because my flash was out, but I wasn’t cut off, so I think that’s why everything went well. Q. Mickey who used to be ROX’s mid laner played Ekko very well. What’s the difference between you two? Mickey uses the champion’s attributes very well. I’m good at positioning while we push side lanes and in teamfights. Q. There are many different champions that are being considered recently. Do you think that picks like Viktor with Fleet Footwork or Lucian will appear? I think Viktor with Fleet Footwork might be seen. I sometimes pick mid Lucian to counter Galio or Kassadin, but that’s only for my own fun, because I can attack the opponent one-way (Laughs). Otherwise, I’m preparing some champions that other players don’t play. Q. You’ll be playing against SKT T1 on Saturday. You lost against them in round 1, how do you think the match will go? Recently, SKT is playing quite well. We’ll do our best in practice to win that match. Q. It seems that you’re one of the contenders for the postseason. I think we have about a 60-70% chance for the playoffs. If we just maintain our recent performance, I think we can reach the playoffs. Q. The team atmosphere seems to be very good. Who would you say that contributed the most to your winning streak? The bottom duo was always good, and recently, SeongHwan is putting in a lot of effort and is good too. I think I’ll say SeongHwan. He does a good job in the jungle and initiates teamfights really well. He’s especially good with Jarvan IV. Round 1 is over now. I want to show a different, stronger ROX Tigers in Round 2.